Primeau Music has been serving collectors of Radios, Records, Musical Nostalgia and Coin-Op worldwide since 1974. We have been featured in many publications including Antique Trader, Antique Weekly, Jukebox Collector, Always Jukin', Coin Drop International and Gameroom Magazine as well as many antique and toy collector magazines and newsletters around the world. We have been on the web as Primeaumusic.com since 1998. The unique styling of our collectible antique radios and record players have become famous throughout the world earning us a reputation as being one of the premier dealers of Collectible Bakelite Radios. Our Radios have been featured in major motion pictures and TV shows. 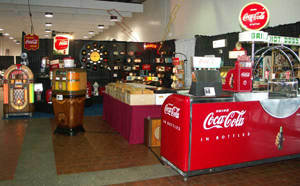 Our company and product have highlighted some of the largest collector shows in the U.S., including the Atlantique City Antique Show, New York Pier Show, Dallas, Antlanta, Hershey and Philadelphia Gameroom Shows; and Chicagoland Jukebox, Slot Machine & Antique Advertising Show. Our customers include many highly placed and important people with very discriminating tastes. The 78 and 45 RPM records of JukeJointRecords.com have been a favorite among collectors for many years, earning for us many repeat and referred sales. Our ever changing stock represents all categories of music; including Rock & Roll, R&B, Soul, Big Band, Blues and many other types of music. Our interactive database of 78 RPM and 45 RPM records allows you to customize your search to include or exclude items, and to refine your search to your specific needs. Title Strips, Title Strip Printing Software and Custom Title Strip Printing Service is also available on this site. We offer a search service for those who do not see what it is that they are looking for on our pages, keeping your want list ever in mind when purchasing collections or single records. Primeaumusic.com is also adding a section for vintage audio enthusiasts. We are working to host a nice selection of vintage stereo equipment to make your listening experience that much richer. "Well thanks so much for the personal information. What a pleasure to feel like I'm actually dealing with a person. : )"
"I received the radios and LOVE them!! Thank you for your help." "Hi Scott, - Back in town, got the records. Thanks, as always they are great! You definitely have the best." "...It's refreshing to deal with someone online who actually understands customer service. I was really impressed when you responded to my first email on Sunday. I won't hesitate to check your site again!" "Hi Scott......after I sent you that last email, I went to my mailbox and the 45's were there.......it was great .......they were in great shape......thanks again...I will definitely go back to your website to purchase more stuff......"
".....that's the thing I like about your company....you answer email ASAP and give it that personal touch...thanks again..."
"Thanks, Scott - glad I found out about your company - great site!"